Mmmmmmmm pudding, that’s what winter is all about. And this one is gluten-free into the bargain, so it’s good for those who need to follow a gluten-free diet, along with those of us who just need a treat. 1. Preheat oven to 180°C. Grease 6 x 1-cup capacity ovenproof bowls. Melt butter and chocolate in a bowl then whisk until smooth. 2. Place cocoa, sugar, orange zest and juice in another bowl. Combine both these mixtures and stir until smooth. Stir in ground almonds and egg yolks. 3. In a clean bowl, beat egg whites until soft peaks form. Fold egg whites into chocolate mixture. Spoon mixture into prepared bowls. 4. Bake for 30 minutes or until an inserted skewer comes out moist but clean. 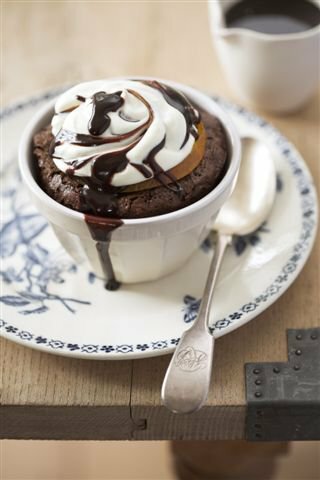 Serve warm, topped with whipped cream or yoghurt and chocolate orange sauce. 1. Melt cream and chocolate in a bowl. Whisk until smooth, then whisk in orange liqueur.